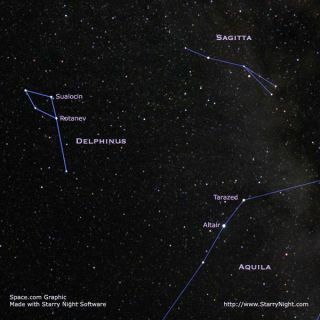 From midnorthern latitudes in September, Delphinus can be seen high in the southern sky around midnight. Less than an outstretched hand's width away from Altair, one point of the Summer Triangle asterism, the dolphin appears to be doing a playful backflip out of the Milky Way (seen here on the right). If you have ever considered "purchasing" a star for the purpose if attaching your name or the name of a friend or relative to it, the following tale is for you. Some commercial companies purport to allow you to name a star. Typically, for a fee, they'll send you a nice certificate and a chart from a star atlas showing the position of "your" star. The only problem is that the star name that you purchased amounts to nothing more than a novelty and is not officially recognized by any reputable astronomical or scientific institution. Admittedly, the name might exist in the ledger of the company that sent you that nice certificate, but if you named a star for, say, your Aunt Martha, don't bother visiting your local observatory and ask to have them show it to you; so far as they're concerned "Aunt Martha's Star" doesn't exist. But then again, there are ways to get around this, asa couple of Sicilian astronomers proved almost two centuries ago. One of the smallest constellations is reaching its highestpoint in the southern sky at around midnight local daylight time this week:Delphinus, the Dolphin. It certainly attracted the attention of ancientwatchers of the sky, for despite its tiny size and the fact that it onlyconsists of faint stars, they're very closely spaced and easily seen on dark,clear nights. Here you will find a small diamond with perhaps one or twostars below it. There is something especially cute about it, positioned out inthe dark just east of the bright summer Milky Way. Some reference books refer to the diamond as "Job'sCoffin" though the origin of this name is unknown. Two stars in theDelphinus diamond have rather odd names: Sualocin (Alpha Delphini) and Rotanev(Beta Delphini). They first appeared in the Palermo Star Catalogue in 1814,but nobody seemed to have a clue as to their origin. The English astronomerThomas Webb finally solved the mystery by reversing their letters, revealingthe name of Nicolaus Venator, the Latinized form of Niccolo Cacciatore, thevalued assistant and eventual successor of Palermo Observatory's directorGiuseppe Piazzi. But to this day nobody knows for sure whether it was Piazzi orCacciatore himself who ultimately christened these two stars. During the 1960s and 70s, one of the most popularpeople ever to lecture at New York's Hayden Planetarium was Dr. Fred Hess(1920-2007), affectionately known to many in the New York metro area as the "ElmerGantry of astronomy." Whenever he gave a tour of the summer night sky, Dr.Hess would entertain his audiences by telling the story of Sualocin andRotanev. He then would embellish the tale by stating that he was always jealousof Cacciatore and decided on his own — in tongue in cheek fashion — to name thetwo other stars in the Delphinus diamond. For the star Gamma Delphini, he assigned the name "Derf,"which is "Fred" spelled backwards. And since the well-knownastrophotographer Robert Little was one of his best friends, Dr. Hess referredto the star formally known as Eta Delphini as "Bob," which was "Bob"(a palindrome) spelled backwards! Of course, the "Derf and Bob" monikersrarely got much beyond the confines of the Hayden Space Theater. But it wasmuch different story in the late 1960s when, during NASA'sApollo program, three reversed names which started out as a prank wereunknowingly assigned to three stars. The Apollo spacecraft that took mento the moon were designed to operate under inertial guidance, withgyroscopes keeping them pointed in the right direction. But because thegyroscopes tended to drift, the Apollo astronauts had to periodicallyrecalibrate the system by sighting on known stars. There were 37 in all. Astronauts Virgil Grissom, Roger Chaffee and EdwardWhite were to be the crew members on the very first Apolloflight. While training in celestial navigation however, Grissom, as apractical joke, quietly incorporated three new names onto NASA's star list:Dnoces (which was really Iota Ursae Majoris or Talitha), Navi (EpsilonCassiopeiae) and Regor (Gamma Velorum or Suhail). In later missions, these three maverick stars wereaccorded the same respect as celebrated ones like Sirius, Vega and Aldebaran. Theyeven turned up on some official star maps that were published during the late1960s and 1970s. But what did they stand for? As it turns out, Dnoces is the word "second"spelled backwards, a reference to Astronaut White (Edward White, II, who wasalso the second man to walk in space). Navi was Grissom's middle name (Ivan)spelled backward, and Regor was Chaffee's first name in reverse. Today, the names are classified by most referencesources as "disused or never really used." Sadly, Grissom had no ideathat his celestial jest would turn into a memorial to himself and hiscrewmates. All three perished in a fire that enveloped the Apollo command moduleon January 27, 1967.